This is one of the most fascinating and controversial aspects of Shroud research. Images of coins, minted by Pontius Pilate for use by the Jewish population in Palestine, have been tentatively identified over both eyes of the man whose image is seen on the Shroud. But is the identification valid? In 1978, scientists, including John P. Jackson and Eric J. Jumper, while working with NASA's VP-8 3-D Image Analyzer, discovered what appeared to be raised button-like shapes over each eye. Then in 1980, Francis Filas, S.J., of Loyola University in Chicago and Michael Marx, an expert in classical coins, examined the area over the right eye and detected patterns of what appeared to be the letters UCAI (from TIBERIOU CAISARUS). They also found a lituus design (an auger's staff). Filas concluded that this was a lituus lepton coin minted by Pontius Pilate between 29 and 32 CE. Over the left eye, Filas also identified what he believed to be a Juolia lepton with a distinctive sheaf of barley design. The Juolia lepton was only struck in 29 CE in honor of Tiberius Caesar's wife, Julia. By overlaying polarized images, Alan Whanger at Duke University identified both coins. Alan found 74 points of congruence with an existing lituus lepton and 73 points with a Juolia lepton. But such identification is highly interpretive and other researchers do not find the same level of congruence. Many argue that congruence analysis, used for instance to match fingerprints, is valid for matching two identified samples (e.g. two fingerprints or partial fingerprints) but not a valid method for identifying a unknown sample (e.g. is it a fingerprint, is it a coin image). Though the lepta (plural of lepton) minted in Palestine were Roman produced coins, the inscription of Tiberius Caesar would have been written in Greek as TIBERIOU KAISAROS. Was the C, where a K was expected, a misspelling? This was a problem that seemed to preclude positive identification until an actual Lituus lepton was found with the aberrant spelling. Several have since been found. This anomaly seems to give credence to the coins identification. My personal opinion, based on my photographic experience and my close examination of the Shroud itself, is that the weave of the cloth is far too coarse to resolve the rather subtle and very tiny inscription on a dime sized ancient coin...What he [Filas] saw as inscriptions, I saw as random shapes and noise. Such is the subjective nature of image analysis. For these reasons however, I cannot accept these coin "inscriptions" as viable evidence of a first century Shroud "date"...I do not argue that there appears to be something on the eyes of the man of the Shroud, and it may well be coins or potshards, since they were used in some first century burial rituals, but I do not believe we can resolve coin inscriptions. Many current authors, among them John C. Iannone in "Mystery of the Shroud of Turin" and Kenneth E. Stevenson in "Image of the Risen Christ," support the findings of the coins. 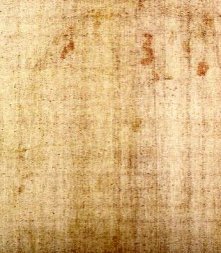 Mary and Alan Whangers, in their book The Shroud of Turin: An Adventure in Discovery, make a strong case for the findings of the coins. Many shroud researchers, though perhaps convinced of the Shroud's authenticity, do not believe that there are coin images on the Shroud.